Sydney Shop Girl: Life This Week 30/7/2018: Happy 120th, QVB! 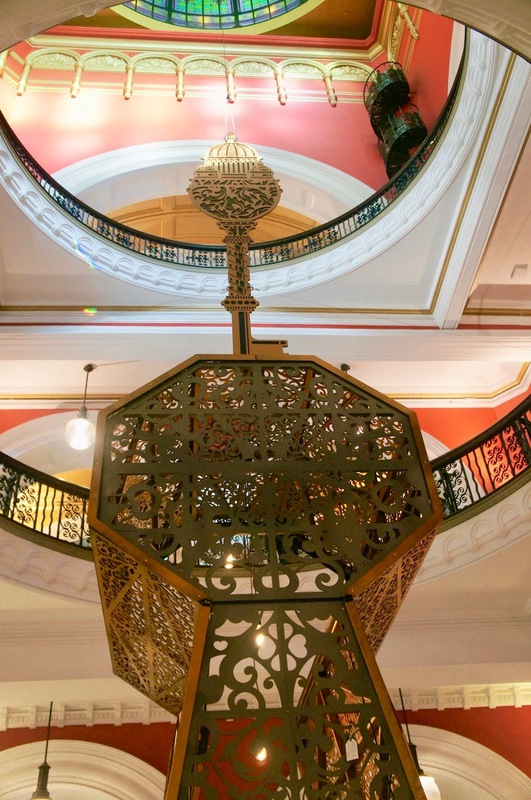 The Queen Victoria Building is 120 years young this month. But between 1893 and 1898, this heritage listed, this 30m by 190m rectangular jewel of Romanesque Revival architecture has a very special place in my heart. It was one of the first places I explored on my first trip to Sydney a very, very long time ago. It was around 2005 if my memory serves me correctly. The theme of this year's birthday celebrations is 'Memory Lock'. Comprising of a five metre high lock with a key suspended above it, the key symbolises 'the unlocking of magical moments' and the lock is 'the symbol of cherishing them forever', according to the QVB's official website. The key and lock were designed in conjunction with James Dive and Scoundrel Projects. 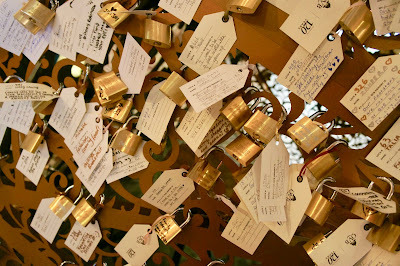 Visitors to the installation are able to attach a lock and a handwritten message to it in a reference to the padlocks of the Pont Des Arts in Paris. I'm a bit of romantic when it comes to places and this project got me thinking about what the QVB means to me. My first memories of it was the mass of people that I somehow melded with the moment I entered. Coming from the quiet and wide open spaces of Perth, the crush of humanity was a bit overwhelming. People were walking this way and that all around and sometimes practically on top of me. With purpose and with speed. There were people everywhere I turned, there were new things to see if I so happened to pause for breath, close my eyes and reopen them. Sydney was a blur of energy to me on that first trip. I've mostly acclimatised in the years since I've moved here and the QVB is no longer just the slightly daunting old building I need to get to in order to get my supply of Haigh's dark chocolate peppermint frogs. The QVB is Christmas. That spectacular central tree dripping in crystal and the rose blanketed rotunda where Santa lives for the season. The QVB is also an eclectic selection of shops whose windows always hold something to capture my imagination. The QVB hosts the only Hobbyco store Master SSG visits. He's grown up watching the electric model train in the front window and together we've seen the detailed seasonal changes the store makes to the display periodically. 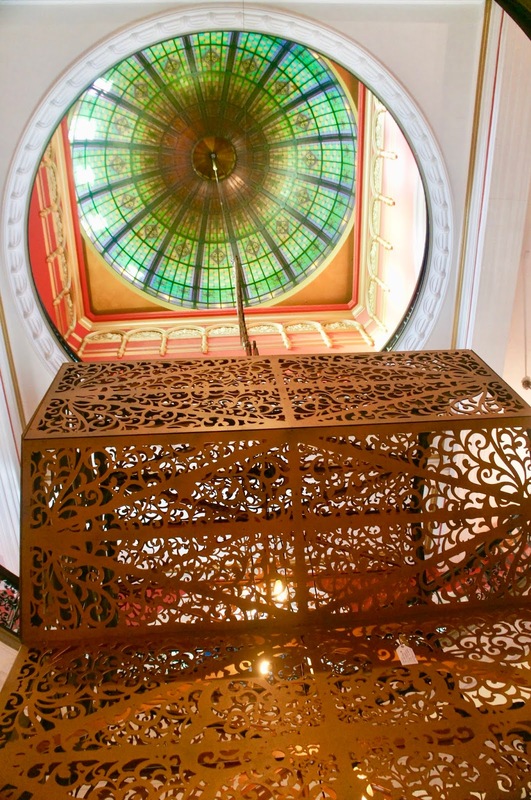 The majestic beauty of the QVB (politely) demands that you dress up for afternoon tea with good friends or else a coffee at one of the cafes that overlook the central tiled walkway. Happy Birthday. QVB!! You're such a special part of the lives of many Sydneysiders and we all wish you a long life and good health (in your foundations and other essential structural components). 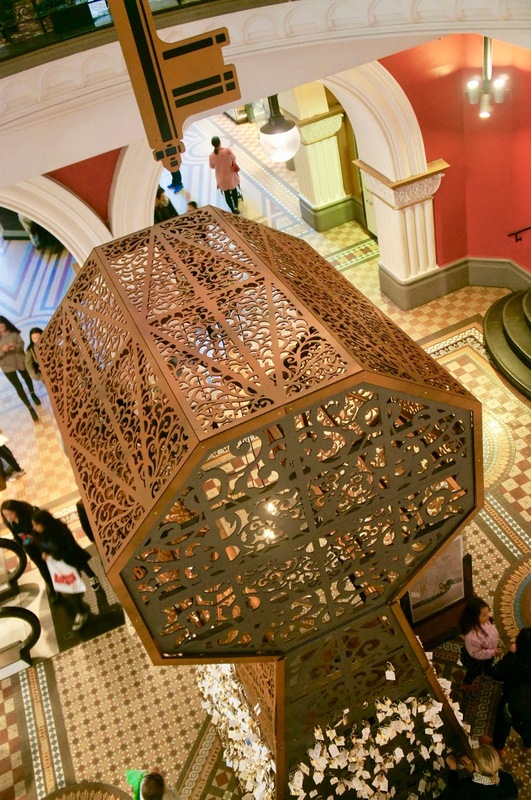 What does the QVB mean to you? I first remember it from 1987 when I started university in Sydney which was a culture shock for a girl from rural Queensland. I loved the shops and it did start my addiction to Country Road and handbags. 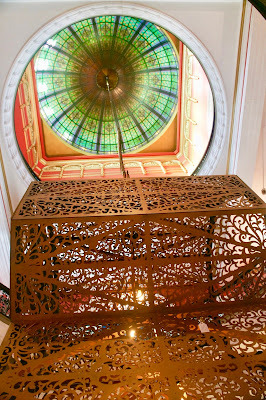 Thanks for sharing your special place, QVB! Hi SSG, I've not seen the QBV since it was renovated but it has always been iconic in Sydney. Love the idea of the Memory Clock and isn't the dome gorgeous? Happy birthday QVB. I remember the first time I ever walked inside. I'm sure it was around 1988. I thought it was the most incredible building I'd ever laid eyes on. I hadn't traveled much at that point so to me it was probably the oldest building I'd ever laid eyes on (although some houses in Goulburn are of a similar age - my parents current house a case in point). But yes, QVB is very majestic. Such a lovely old lady. I'm with you - possibly my favourite building in Sydney & one I can't resist photographing. Wishing the old girl a fabulous birthday. She is a beautiful old thing. There is something so amazing about old stylish building. As they say - if only she could tell her stories. It's a beautiful building! I haven't visited Sydney often but I at the very least manage to pass by it when I visit - it's a great spot and it's nice to see it's celebrating a major milestone! It holds a special place in my memory too as an icon I loved visiting when I lived in Sydney. My last memory was sitting having an early coffee in a coffee shop looking out onto the different levels before going to an all-day training course in the city.